India and the US held their inaugural 2+2 dialogue in New Delhi on 6 September. The meeting set the scene for their bilateral ties to reach new heights. 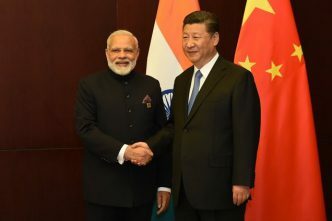 The commonalities of their security interests are visible through several initiatives outlined in their joint statement and should enable them to firm up their defence and security ties. What stood out distinctly but has escaped common scrutiny is the statement’s narrative on terrorism. 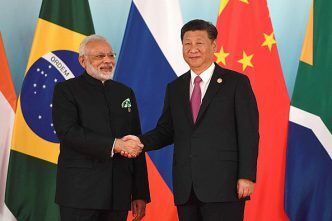 While the language is anodyne on civilian nuclear cooperation, export controls, the Nuclear Suppliers Group and North Korea, it’s tough on the joint India–US fight against terrorism. The statement calls out the perpetrators of Mumbai, Pathankot, Uri and other cross-border terrorist attacks on India. The specific mention of terror groups on Pakistan’s soil, including D-Company’s operations, is noteworthy. In a rare semantic convergence, the US seems on board with India in using the latter’s language in the statement. Two important linguistic shifts from the past for the US were the use of ‘territory under Pakistan’s control’ instead of Pakistan’s ‘territory’ to describe Pakistan-controlled Kashmir, and the term ‘terrorist proxies’ (for Pakistan) to describe terrorist groups in the region. It’s important to understand the distinctiveness of the joint bilateral stand on terrorism. 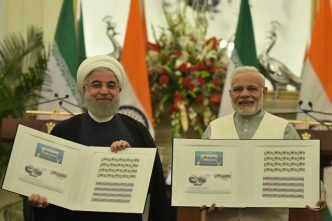 First, in a straightforward manner, the joint statement denounces the use of any terrorist proxies in the region and calls on Pakistan to ensure that its territory isn’t used to launch terrorist attacks. Although the criticism has a precedent in 2017, the language in the latest statement is markedly categorical and harsh. Second, it calls on Pakistan to bring perpetrators of several terrorist attacks on India to justice. There’s a notable mention of the Uri terror strike of 2016. This is new; Uri wasn’t addressed in the joint statement by President Donald Trump and Prime Minister Narendra Modi in 2017. The staunch language is a rare show by the US of its understanding of India’s security vulnerabilities and its victimisation through cross-border terrorism emanating from Pakistan. India has long fought a lonely struggle against terrorism in South Asia. The US’s warning to Pakistan to curb terror networks is a step towards fully appreciating India’s longstanding grievances. The Trump administration has taken several steps to push Islamabad to halt support for militant groups. In January 2018, the administration announced an across-the-board freeze of nearly all security aid to Pakistan, potentially affecting as much as $1.3 billion in annual aid. Recently, the US government announced its final decision to cancel $300 million in aid to Pakistan for not doing enough to root out militants. In an effort to coerce Pakistan to halt its support for militant groups, the Financial Action Task Force placed Pakistan on its ‘grey list’. These developments indicate that the US is willing to follow through on its zero-tolerance policy towards terrorism, even if that means using coercive diplomatic and economic tools to get Pakistan to stop financing and enabling terrorist groups. The September joint statement portrays a comprehensive regional picture of terror-related threats in South Asia, viewing Afghanistan and India as equally vulnerable to resident threats and those emerging from Pakistan. Emphasising its regional approach to counterterrorism, the US State Department’s Country reports on terrorism 2017 categorically notes that Pakistan has failed to act on militants targeting India and Afghanistan. The inclusion of al-Qaeda since 2014 and ISIS since 2016 on the India–US counterterrorism agenda signals a sustained willingness for regionally exhaustive and far-reaching approaches to fighting terrorism. As Washington’s expectations for an expanded regional role by India grow, joint counterterrorism efforts by the two countries in Afghanistan could emerge as a strong possibility—especially as other countries have stepped up in that direction. India and the US have cooperated to prevent terrorist activities through bilateral and global platforms. Both are members of the 30-member Global Counter Terror Forum launched in 2011. 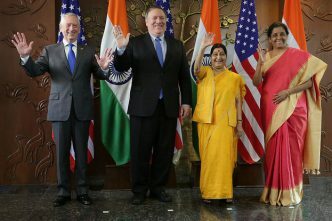 In January 2018, Kenneth Juster, the US ambassador to India, underscored the launch of a first US–India Counter Terrorism Designations Dialogue to disrupt and dismantle terrorist camps both regionally and globally. By invoking UN resolution 2396 (on returning foreign terrorist fighters), both countries have gone beyond counterterrorism efforts constrained within South Asia. They’ve agreed to deepen cooperation in international forums such as the UN and the Financial Action Task Force to fight terrorism, and Indian External Affairs Minister Sushma Swaraj has stated that counterterrorism cooperation has acquired a ‘new qualitative edge and purpose’. Reportedly, India and the US are also discussing the prospects of introducing another resolution at the UN to outlaw Jaish-e-Muhammad’s chief, Masood Azhar. India–US cooperation on counterterrorism issues is not new. 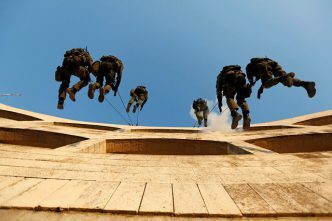 Since the mid-2000s, both countries have systematically taken several steps to strengthen their collaboration through intelligence sharing, information exchanges and operational cooperation. India has also benefited from the US’s provision of access to advanced counterterrorism technology and equipment. 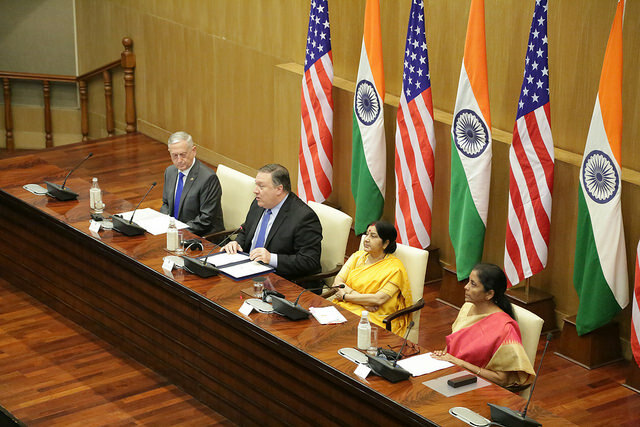 The language in the 2+2 dialogue joint statement is qualitatively stronger than that in all the previous official documents between India and the US, and so provides an opportunity for Indian security planners to deepen bilateral cooperation. India should take advantage of this growing American recognition of the challenges that New Delhi faces in combating terrorism emanating from Pakistan and ensure that the perpetrators are brought to justice. Sylvia Mishra is a Herbert Scoville Jr Peace Fellowship fellow based in Washington DC. Vivek Mishra is an assistant professor in international relations at the Netaji Institute for Asian Studies in Kolkata, India. Image courtesy of the US State Department.